A man who was acquitted of murder in 1994 is on trial again after "fresh evidence" emerged over the killing of a father-of-two, a court heard. Andrew Everson is accused of shooting David Watkins in an "execution" style murder in Searles Farm Lane, Pingewood, near Reading, on 14 January 1993. Reading Crown Court heard Mr Everson, 54, who denies murder, had been cleared in February 1994 of killing Mr Watkins. The judge said a retrial was ordered after a review of the original case. The court heard Mr Watkins, 30, a cannabis dealer from Reading, had been shot in the back of a head with a shotgun in what prosecutor John Price QC said was "in effect an execution". Mr Price said police discovered new evidence during a review of the death in 2012. The court heard further scientific tests revealed a "close match" between fibres on Mr Watkins' clothing from 1993 and fibres used in the "upholstery" of Mr Everson's Peugeot 309. Mr Price told jurors the new evidence suggested Mr Watkins "must have been" in the defendant's car hours before his death, something Mr Everson, of Weymouth, Dorset, had denied when questioned in 1993. 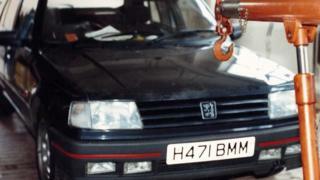 He said "small but detectable" gunshot residues were found in vacuum samples from the Peugeot. Mr Price said Mr Everson - who did not give evidence at his 1994 trial - had "completely changed his account of where he was and what he was doing on the night of the shooting". He said Mr Everson now admitted he had purchased a shotgun in 1992 to "have a little bit of fun with", before getting rid of it days later. The weapon used to kill Mr Watkins was never found. The court heard Mr Watkins, who supplied cannabis on a "commercial and quite substantial basis", had gone out to meet a drug dealer to "buy a large amount of cannabis". Mr Price told the jury Mr Everson "was also a drug dealer in cannabis, but he operated at a higher level than David Watkins, it's alleged he was known to others as Drew". Jurors were told the defendant denied being known as Drew when he spoke to police in 1993.